October 8, 2018 By This post may contain affiliate links. 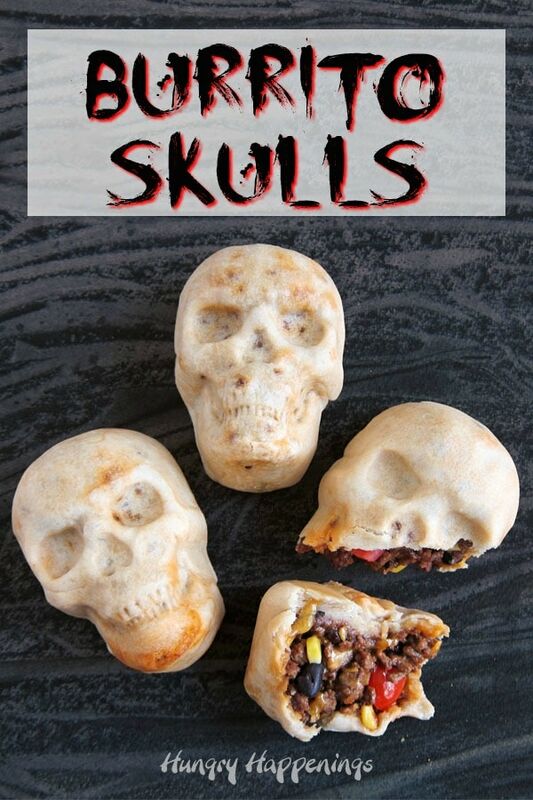 Creep out your friends and family this Halloween by serving them these Burrito Skulls. You can stuff your three dimensional, skull shaped, homemade tortillas with taco meat and your favorite burrito fillings. 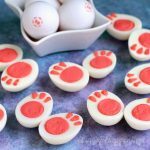 Do you love creepy Halloween food? 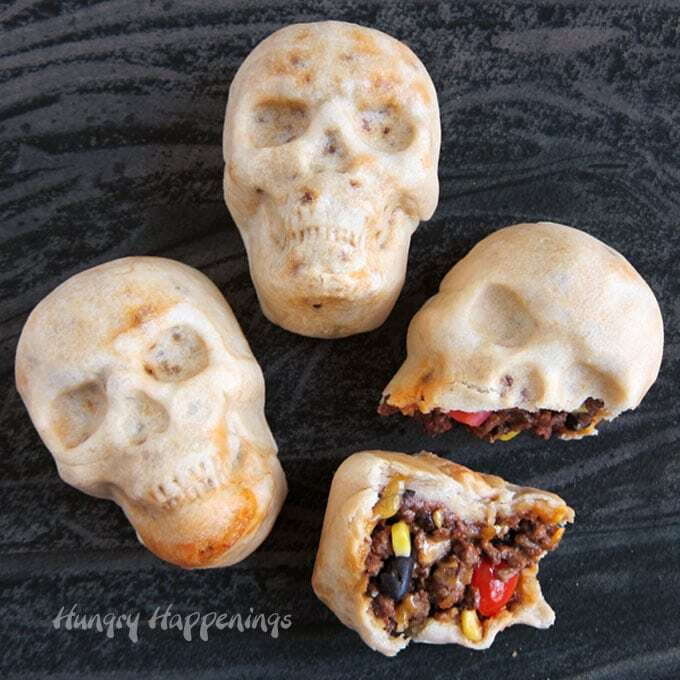 I never thought I would until we started hosting Halloween parties, then I really got into creating food that would make my party guests squirm like these Burrito Skulls. This is the third variation of a stuffed skull recipe that I have made over the years. 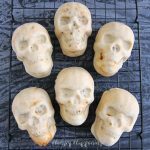 My Pizza Skulls (yes, I was the originator of that really fun Halloween recipe!) 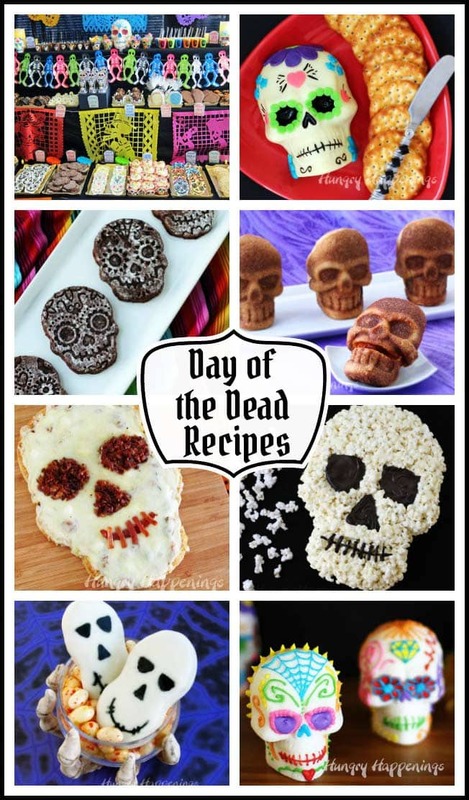 and my Enchilada Skulls have been so popular that I couldn’t resist going back into the kitchen to come up with another fun skull shaped Halloween meal. This year I chose to make skull shaped burritos which I filled with taco meat, cheese, black beans, corn and tomatoes. The beauty of a recipe like this is that you can switch up the fillings and use what you like best. Whisk together flour, baking powder, and salt then cut in half the lard at a time until the mixture resembles course crumbs. Start by adding 3/4 cup of water (hot but not boiling water works best) to the flour mixture, stirring it just until the dough comes together. If needed add more water, a little at a time. Knead on a flour dusted counter top or cutting board until the dough comes together into a ball. Cover the dough and let it rest for 10-20 minutes. Can I make the homemade tortilla dough in the food processor? Yes! I love using the food processor to make this dough. Pour the dry ingredients into the food processor and pulse a few times. Add all of the lard and pulse just until the lard breaks down into small crumbs. Turn on the food processor and pour the water in through the hole on top of the lid until the dough comes together in a ball. Let the dough rest in the food processor. Do you have to use homemade tortilla dough to make Burrito Skulls? If you have access to tortilla dough (from a Mexican grocery store) then you can use that instead. For a less traditional flavor, you can use store bought pizza dough or even crescent roll dough (buy the sheets, not the triangles). What is lard and do I have to use it to make homemade tortillas? It is a monounsaturated fat so it’s has more similarity to olive oil than to butter. If you use homemade lard it is trans-fat free unlike store bought lard. You know all the oil that comes off your bacon in the morning? Save it and use it to make these tortillas. It’s shelf stable so just pour it into a jar and let it cool until it thickens. You can also store it in the refrigerator. Where can I get lard? It’s best to make your own lard by rendering the fat from pork belly, back, or bacon or you can get it from the butcher. The sticks you can buy at the grocery store (near the shortening) are more like shortening than real lard. If I can’t find lard what should I use? You can use shortening in this recipe, but it won’t give you the same flavor or texture. I used taco meat, cheddar cheese, black beans, corn and tomatoes. You can use chicken or pork and your favorite cheese. Swap out re-fried beans, add rice, and spice it up with some hot peppers or sauce. You must have a skull shaped pan in order to have your burritos bake in the 3 dimensional skull shape. I ordered mine on Amazon but have heard from readers who have found the Nordic Ware pans in kitchen ware stores and department stores. Cut the tortilla dough into 6 equal sized pieces then roll the pieces out into rectangles or ovals. Spoon in the burrito fillings being sure to gently push the filling down into the skull. This will help to ensure your dough really gets imprinted with the skull shape while baking. Fold the dough over the fillings, cutting off any excess dough, and brush egg wash over top before baking. 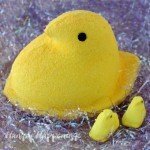 The egg wash (an egg mixed with a splash of water) will help keep the dough from separating in the oven. Once baked the top of the dough will turn golden brown. When you turn the burrito skulls out onto a cooling rack you will notice the dough will still look rather pale, which is cool because they will look like an aged skull. 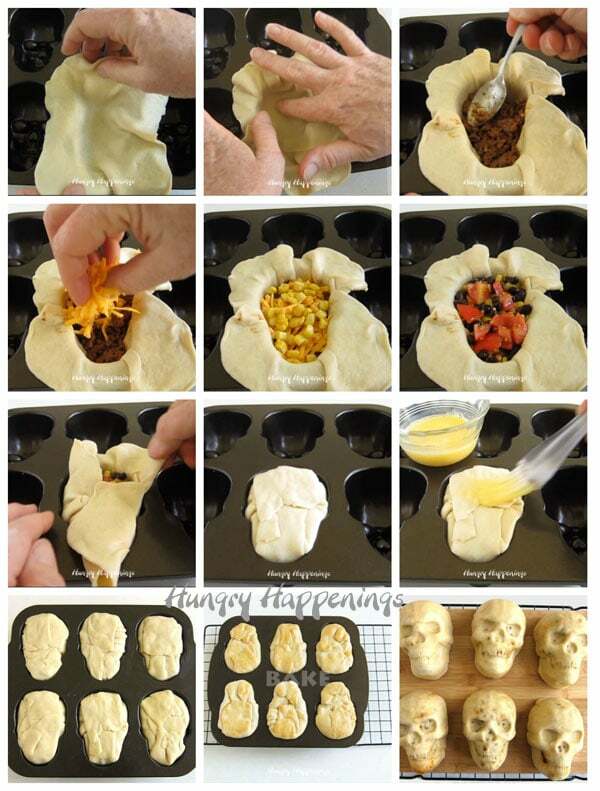 If you use pizza or crescent roll dough the skull will look much darker in color like the Pizza Skulls. Crispy skull shaped homemade tortillas filled with taco meat, black beans, corn, and tomatoes. 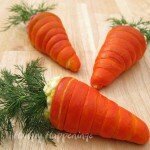 Serve with a side of sour cream or guacamole for Halloween or the Day of the Dead. Slowly pour in the water stirring as you go until the dough comes together. Add at least ¾ of a cup of the water then only add any remaining water as needed. Knead the dough on a flour dusted cutting board until the dough is no longer sticky and comes together in a cohesive ball then cover the dough and set aside for 10-20 minutes. Heat half of the oil in a large skillet set over high heat. Add half of the ground sirloin and cook until browned. Remove from skillet and add the remaining oil then brown the remaining meat. Add the other meat back into the pan and stir in the taco seasoning and water. Bring to a boil then reduce heat to medium low and simmer until most of the water has evaporated. Fill with 1/6th of the taco meat. Sprinkle on 1/6th of the cheddar cheese, black beans, corn, and tomatoes or you favorite burrito filling. 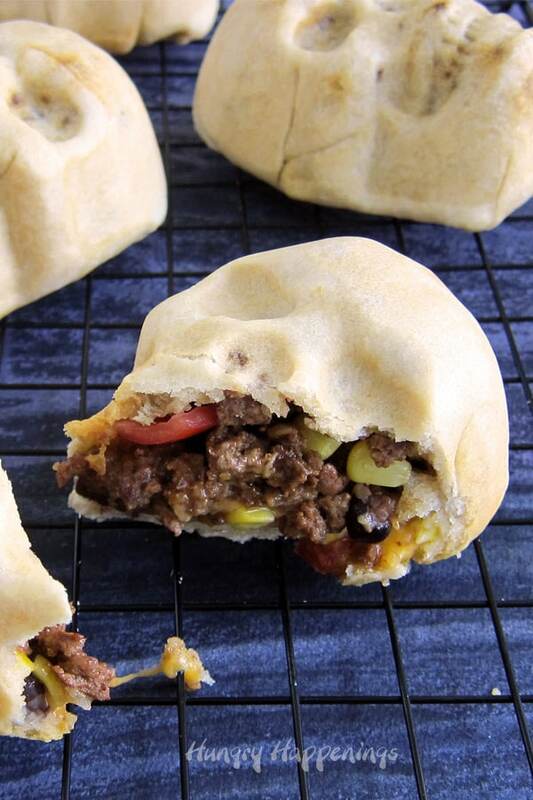 Fold the dough over the filling, cutting off any excess dough and pinching the seams together. Whisk together the egg and water then brush the top of the dough with egg wash.
Repeat filling all 6 skulls. Bake for 24-26 minutes until the tops of the dough turn lightly golden brown. Remove from oven and set pan on a cooling rack for a few minutes then turn out the burrito skulls onto the cooling rack. Serve with a side of sour cream, guacamole, or salsa. 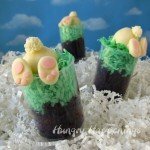 and over 100 Halloween recipes, here. Have fun making these Burrito Skulls. 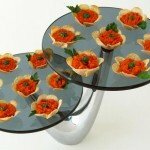 If you share pictures online be sure to mention Hungry Happenings, link back to this page and use #hungryhappenings. Thanks! I love all your skull foods (and all Halloween as well)! I will be bringing these and your enchiladas to a pumpkin carving party on the 20th. Do you have any Jack-O-Lantern recipes that light up in the middle? Is there a way to move your facebook, twitter ect. link to the right side of the screen? It covers your page and does not have an arrow to collapse it. I am so happy to hear you have enjoyed my skull shaped foods! I hope all the people at the pumpkin carving party love the items you are bringing. I have not made any light up jack-o-lanterns but that is a great idea! Thanks for letting me know about the social media buttons. I will work on getting them moved. They don’t do that on my screen, so I am appreciative of you alerting me to this problem. I’m so happy you enjoyed the Burrito Skulls! 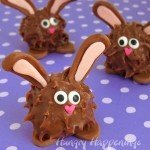 When I made these we ate them as left overs for a few days. I reheated them in a toaster oven for about 15 minutes at 350 degrees. They could have been a bit hotter but they were heated through at that point. The homemade tortilla dough works great. I made pizza skulls last night using tubes of pizza dough and have to admit that I definitely prefer the flavor and texture of the tortilla dough. Even though it’s a bit more work, it’s worth it. 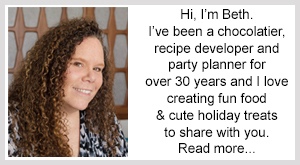 If you want to make them ahead of time you can bake them then just reheat them for a party or you can make them a few hours before, wrap the pan really well with tin foil, then bake them just before your guests arrive.